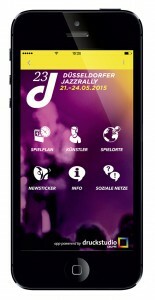 The Druckstudio Group is producing the programme brochure for the upcoming Düsseldorfer Jazz Rally for the eighth consecutive time – and this year it is introducing a new app for the jazz highlights on the Rhine, too. 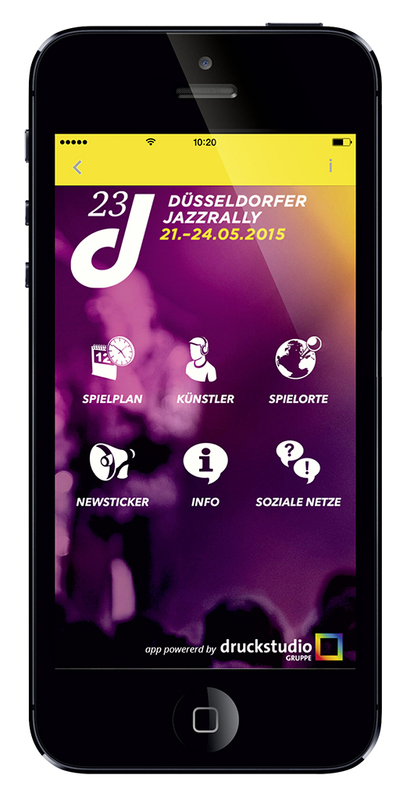 The app for the event will be available free of charge for Apple and Android smartphones from 1 May. Alongside the programme and profiles of the musicians, the app offers features such as up-to-date news and information, a direct link to buy tickets and navigation to the concert venues for visitors, who are expected to number over 300,000. Every user can put together a personal concert programme via the favourites function. And, of course, the app is linked to Twitter and Facebook. The app can be downloaded from the relevant stores from 1 May.